The Wazir Khan Mosque (Punjabi/Urdu: مسجد وزیر خان Masjid Wazīr Khān) in Lahore, Pakistan, is famous for its extensive faience tile work. 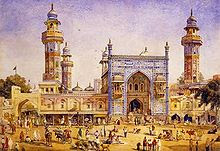 It has been described as ' a mole on the cheek of Lahore'. It was built in seven years, starting around 1634-1635 AD, during the reign of the Mughal Emperor Shah Jehan. It was built by Shaikh Ilm-ud-din Ansari, a native of Chiniot, who rose to be the court physician to Shah Jahan and later, the Governor of Lahore. He was commonly known as Wazir Khan. (The word wazir means 'minister' in Urdu language.) The mosque is located inside the Inner City and is easiest accessed from Delhi Gate. Within the inner courtyard of the mosque lies the subterranean tomb of Syed Muhammad Ishaq, known as Miran Badshah, a divine from Iran who settled in Lahore during the time of the Tughluq dynasty. The tomb, therefore, predates the mosque. After a long time i saw a post regarding my city miss you Lahore. and thanks guys for this website i will bookmark it and do post ASAP i cant wait to see my City where i spend my 21 years of life.